Fancy word for a practical item, a cavaletti is a flip-adjustable hurdle that can help your dog be a stronger competitor! They are used by competitors and trainers for building confidence and "body awareness". Basically your dog walks over them in a row (they are not used for jumping). This challenges him to develop balance and perception, and to strengthen his ability to stretch, lift, and use all 4 legs in a more accurate manner. It is recommended to purchase between 5 and 10 cavelettis for best results. These cavalettis come in 3 sizes (small, medium, large). Within each size caveletti there are 4 height adjustments that can be made by flipping the caveletti over. Please note the specified height adjustments below. Some adjustments are small, while others are greater. To determine the general caveletti size needed, measure your dog's rear "hocks" when he is standing on all fours (the distance from the ground up to his elbow joint). Then choose a cavaletti that has the most sizes that are at or under your dog's hock size. Made of UV resistant plastic, with plugged ends, 3' in width. Comes with decorative tape and training tips for various cavaletti exercises you can do. We suggest getting a minimum of 4 cavellettis, but preferably between 5 and 10 for best results. Order our 5 Packs and save up to 40% on shipping. Remember that the goal is not for your dog to jump over them, but to walk over them. If your dog has a 12" hock or larger, we suggest getting all larges. If your dog has a 11" hock, you can use only 3 sizes within the large. We suggest you get mostly larges, and throw in 1 or 2 mediums if desired. If your dog has a 8"-10" hock, we suggest getting all mediums. If your dog has a 7" hock, you should not use the 8" height in the medium, but you can use the other 3 heights. We suggest getting mostly mediums, and throw in 1 or 2 smalls if desired. If your dog has a 6" hock, we suggest getting all smalls. If your dog has a 5" hock, you would want all smalls. You should not use the 6" height on the small. 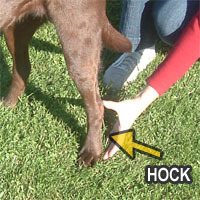 If your dog has a 3- 4" hock, you should only use two heights on the small size, so get all smalls.